There are very few Amana or Speed Queen washers up here where I am, so I have limited experience on them. 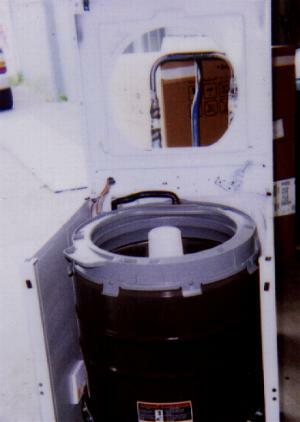 I have put together some common pictures and information that I hope will help you with your washer problems. Always remember Electricity is dangerous and should be treated with respect. Can my rubber fill hoses ever burst ?? How does the agitator come off my washer?? 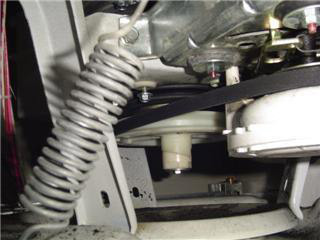 Washer belts: If your belt on any washer looks like these, replace the belt(s). 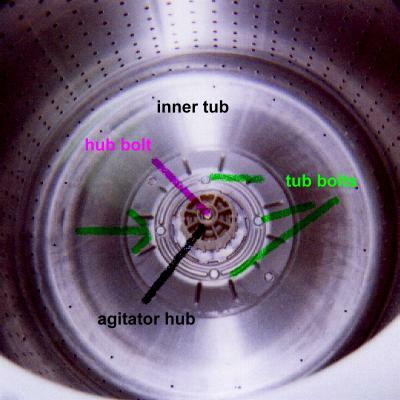 A common way to access the washer workings is here. Remove the screws at the bottom of the front panel, pull the bottom of the panel out to release it from the top. Remove two screws just inside the top front of the top panel and the top will tilt back. 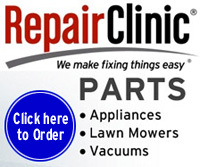 Many times a leak can be traced to the pump, the pump is a common trouble maker. Center seals ( middle under outer tank ) is another common trouble maker. See how to take apart. The newer style one belt Amana washer has has some belt problems, sometimes the belt does not slip correctly and the inner basket spins too quickly and some of the water is thrown up and over the tank cover. 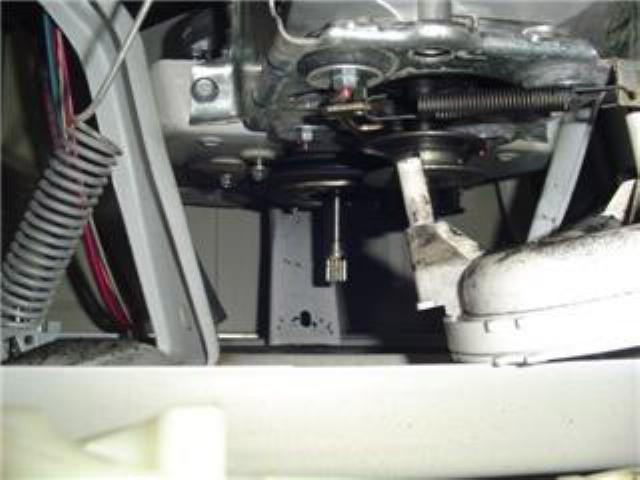 Many times a new belt and idler pulley is required to correct this, motor pulley is cleaned and the tank cover cover gasket is sometimes needed to be replaced. 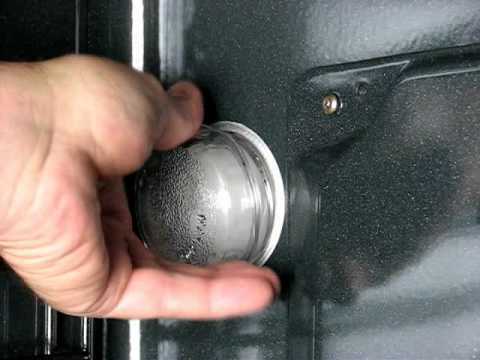 Some leaks can be traced to a bad tub seal.... Center seal replacement repair aid. for the 356P3 seal kit. There is a sediment tube on the wash basket. This sediment tube becomes brittle over the years and can break. This will cause water leakage into the outer tub during the wash mode. Since the pump is turning all the time the washer is running, the water will be pumped out too soon. The tube can also become loose and clang around during the spin mode causing a noise problem. **Take the front cover off and you will find brake pad pieces in the bottom. Now some say you have to pull the center out to replace the pads...I don't. Here's how I do it.. Remove old screws were brake pads use to be and loose them! Kits comes with new screws that you must use. The transmission will turn free without the brake pads. You will need a 3/8 stubby ratchet. Insert 0ne pad in place toward the front and line up holes with front set of holes in mounting plate. NOW....spin trans around until the pad is near the back set of mounting holes. I use an Allen key to align holes and put rear screws in. Once you get the back one in the 2 front ones are easy. Don't forget to bring a new belt with you!!!!!!!!!!!! NOTE:.....You must coat the new brake pads with a little silicone grease** A copy from TheApplianguy of AOL...Thankx!! First remove 2 front springs, then remove 4 bolts holding motor cradle to frame and outer tub, leaving the 4th right front bolt holding till last. 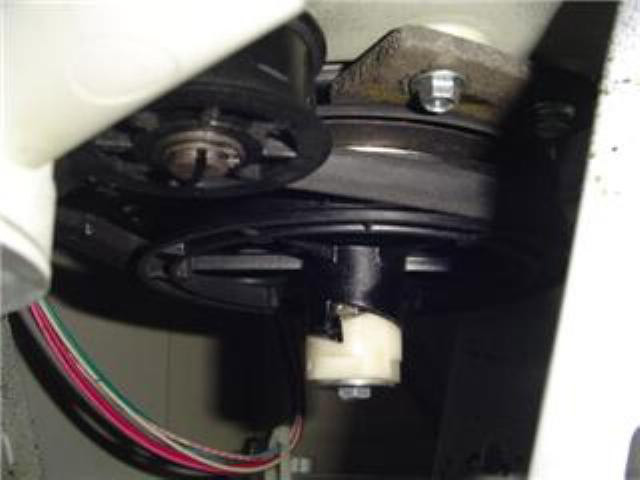 Loosen this bolt and the motor will tip down were you can remove the wiring block on top of motor. Now with the bolt removed the belt easily slip off transmission pulley. Motor, belt and pump will just have enough room to come out. If you choose not to remove hoses to the pump just twist motor and pump to the right. It's a little tight, remove the three ( Torx heads ) screws holding the pump to the motor. Take a good look at how the belt is around the pump support leg. When reinstalling put the 4th bolt back first, then slip the belt and wiring connection on; check to make sure the belt is in the motor pulley. Push motor up into place; install bolt on opposite side near brake then the other 2. The machine sounds terrible and the transmission pulley is moving up and down while in spin. It looks like the helix only locks in for agitate and in spin, the pulley goes up, but this one won't stay. It keeps bouncing up and down. Common trouble makers...transmission, pulley worn. Sometimes the transmission shaft has dropped down, the only fix we've found is to replace it. Sometimes been successful by adding two washers with holes big enough to fit up on shaft of transmission, then a third washer with smaller hole sits at bottom of shaft, helix bolt back on and your done. Been told to remove motor to make working on it better for access. Sometimes replacing the pulley 1/2's is the repair for this problem. 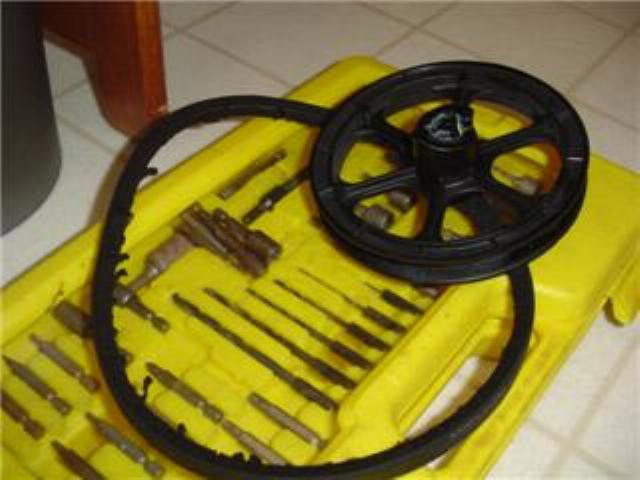 Thundersdad ended up replacing the helix pulley on his washer to repair this problem. Some pictures of that repair....click on the picture for a larger view. I replaced the pulley (which is 1/2 the Helix on the bottom end) & the belt. Belt was shredded to pieces & the pulley was substantially worn. When you take the bottom bolt off, the helix half slides of the end of the splined shaft, & then the pulley just slides right off.